When visiting Europe, the incredible cities are often a highlight. However, only sticking to urban areas means that you’ll miss out on the amazing scenery found throughout the continent. From England’s Lake District to the Gran Paradiso National Park in the Italian Alps, national parks are the perfect way to experience and appreciate the unique landscapes found throughout Europe. As you plan your next European getaway, be sure to make a stop or two at one of the most beautiful national parks in Europe. Jotunheimen National Park in Norway is also known as the Land of the Giants, which refers to the park’s many mountains. The park is home to more than 250 mountain peaks, some of which are among the tallest in all of Europe. In between the many snow-capped peaks are bright blue lakes filled with melted snow, creating picture-perfect scenery. Jotunheimen National Park is also packed with wildlife like reindeer, elk and lynx, and the trout-filled lakes are ideal for fishing. One of the most beautiful and peaceful destinations in England is the Lake District National Park. As the name suggests, the park is home to countless lakes, but equally as appealing are the many mountains, called fells, that dot the landscape. Visitors come to enjoy long walks among the fells and to soak up the views, and there is no shortage of accommodation located within the park itself. When people think of the Canary Island, and the isle of La Palma in particular, it is beaches and resorts that often come to mind. However, the Spanish island is home to the amazing Caldera de Taburiente National Park. The heart of the park is what looks like a giant crater, but what is now known as a mountainous arch. While in the Caldera de Taburiente National Park, you can hike along the edge of the mountain, soaking in breathtaking views of green valleys and even the blue waters of the ocean in the distance. On the border between Poland and Belarus is the Bialowieza National Park, a large park that is also the last remaining temperate primeval forest in Europe. If you have always wanted to spot European Bison in their natural habitat, this is the world’s best place to do so. Bialowieza National Park is also a great destination for hiking and cycling though shaded paths and trails. Be sure to stop by the Museum of Nature and Forest of the Białowieża National Park while you’re there in order to learn a bit more about the wildlife and development of the park. In Northern Finland, you’ll find the sprawling greenery and beauty of the Oulanka National Park. 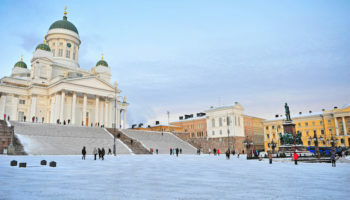 The park protects the land of the Sami people, who lived, hunted and fished in the area until the 17th century. Today, a visit to the Oulanka National Park means the chance to hike along the Karhunkierros, which is the most popular trekking route in all of Finland. Other pastimes in the park include picking berries, mountain biking, canoeing on the many rivers and staying overnight at the wooden cabins that dot the park. Despite the slightly misleading name, the Saxon Switzerland National Park is actually located completely within German borders near the city of Dresden. Bizarre stone formations and spectacular views are only a few of the wonderful characteristics of this national park in Europe that is ideal for climbing and hiking. Even without climbing experience, you’ll be able to visit iconic sights like the spectacular Bastei Bridge and the lofty Königstein Fortress that rises 245 meters (800 feet) above the Elbe River. In the middle of the Graian Alps of Northern Italy is the Gran Paradiso National Park. Originally, the park was created to protect the ibex from poachers, since the area was supposed to be the private hunting ground of a king. Part of the park is forested, and there are also multiple glaciers within its boundaries. Hiking is popular throughout the park, particularly up the summit of the Gran Paradiso Mountain, and there are also stunning views of nearby Alpine peaks like Mont Blanc and the Matterhorn. In Žabljak, Montenegro, is the Durmitor National Park. Surrounded by river canyons, Durmitor is home to enormous peaks that rise up at sharp angles and create a surreal landscape of contrasts. Visiting Durmitor National Park is popular among those who wish to summit the mountains, admire the glacial lakes, ski or even snowboard. In the heart of Scotland is the Loch Lomond and the Trossachs National Park. This national park is home to a number of stunning mountains like Ben More, Be Lomond and Stob Binnein. The West Highland Way is a trekking path through Lock Lomond that brings hikers to several spectacular vantage points and offers the chance to be in seclusion in the middle of lush green landscape. There are a handful of small villages in the park where you can stop for a pint of ale or a pub lunch before making your way to the next stop on the trails. The Pyrenees Mountain Range straddles the border between France and Spain, and that is exactly where you’ll find the Ordesa National Park. The park boasts a lush green valley in the heart of mountain peaks, making for a truly unforgettable view and amazing hiking trails under the shade of the towering Pyrenees. Just some of the wildlife spotted in the Ordesa National Park include hawks, owls, mountain goats and marmots. The magnificent Vatnajökull National Park is found in Iceland, and at its center is the Vatnajökull glacier. The entire park is bursting with contrasts, including snowy mountain peaks, deep blue rivers and even some currently active geothermal areas. Highlights of the park are the glacier lagoon of Jökulsárlón, which is complete with icebergs, as well as the waterfalls called Svartifoss and Dettifosis. The most popular way to explore the Vatnajökull National Park is by hiking, and there are countless campgrounds for those who want to stay overnight within the park. Slovenia’s solitary national park is Triglav National Park, and it surrounds Mount Triglav, the highest peak in the nation. Triglav National Park is in the Julian Alps, which means that it boasts both towering mountains and lush valleys. Water plays a defining role in the park, both for geographical reasons and tourism ones. 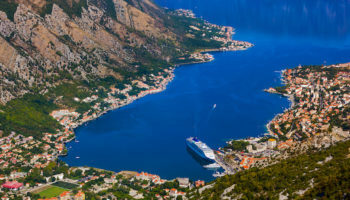 The Soča and Sava Rivers flow from the park to the Adriatic and Black Seas, and the lakes within the park are a major attraction for Slovenian residents as well as visitors from around the world. The Hohe Tauern National Park surrounds a mountain range by the same name in the Central Eastern Alps in Austria. The Hohe Tauern National Park is the largest nature reserve in the Alps, and it is home to tundras, forests and glaciers and waterfalls. Hiking through the park, or hiking to summit major peaks like Großglockner and Großvenediger, is certainly popular. However, equally appealing is just driving through the park and cutting through the mountains via extraordinary tunnels or along the scenic Grossglockner High Alpine Road. 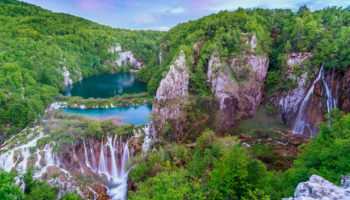 In the middle of Croatia is the beautiful Plitvice Lakes National Park, a forest reserve that is best known for its series of 16 remarkable terraced lakes. Each of the lakes are connected by waterfalls, and they stretch all the way to an equally stunning limestone canyon. Paved walkways as well as more challenging trails wind around these lakes and sometimes right across them, creating spectacular views. It is also possible to enter some of the caves and view the lakes from a unique perspective through the rock itself.